Enjoy your fruits & vegetables in a whole new way! On Saturday 18 March I organize a slow juicing & smoothie workshop with all organic ingredients. Want to learn about the art of juicing, making smoothies, preparing fresh organic pestos, purees, smoothies and more? We will be using the JazzMax slow juicer & powerful Vitamix blender to make different delicacies. During the workshop you’ll discover the ins & outs of juicing and blending, which vegetable and fruit combinations work best, when to juice, how to prepare, how to clean, how to store. As well as how to make your own nut milk & butters, veggie spreads, pesto and smoothies. The price includes workshop, all organic ingredients, and the opportunity to buy a Jazz Max juicer with a special discount. Categories: Health, Workshop, Yogi food | Tags: Brussels, health, juice, juicing, workshop | Permalink. On Saturday 5 March I organize a juicing workshop. Want to learn about the art of juicing, making smoothies, preparing fresh organic pestos, purees, nut butters and more? 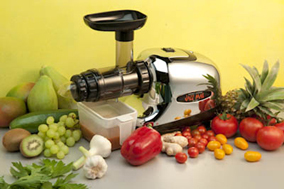 We will be using the JazzMax slow juicer to make different delicacies. During the workshop you’ll discover the ins & outs of juicing and blending, which vegetable and fruit combinations work best, when to juice, how to prepare, how to clean, how to store. As well as how to make your own nut milk & butters, veggie spreads, pesto and even sorbet ice. Categories: Health, Workshop, Yoga info, Yogi food | Tags: Brussels, jazzmax, juice, Sampoorna, workshop | Permalink. Seasons are changing and the temperature is going down , more and more people are catching colds. We all need to nourish ourselves well to protect against viruses and colds. This includes eating at least the 5 suggested portions of fruits and vegetables every day. But it would be even better to take more than that (preferably organic produce). This is especially valid for kids, pregnant ladies and elderly people who might have a more fragile immune system. There’s an easy solution to obtain your daily dose of vegetables & fruits: juicing! Actually, 800 grams of fresh vegetables would be the ideal daily quantity, and only one glass of you fresh juice already gives you 250 grams worth of vegetables. When you juice, you hydrate, mineralize and detoxify your organism. It’s the easy way (back) to health. Vegetable juice is very easy on the digestive system, as the fibers have been taken out; nutrients are transported directly to your cells. So especially if you are tired or stressed and don’t have a lot of time, then juicing is the answer for you! So what more do you need to know? Invest in your health and buy yourself the best gift ever: a juicer. I highly recommend the JazzMax slowjuicer that I use myself and that I also sell as a distributor for the brand. This juicer preserves a maximum of nutrients as it slowly extracts the juice from the fibers; the remaining pulp is very dry. You can store your juice in a Mason jar or glass bottle in the fridge and it should keep for 48 hours (however, I still drink it after 4 days sometimes). Besides making juice, your JazzMax juicer also makes: pesto, sorbet , vegetable spreads, humus, seed & nut butter & oils, tapenade. Some of my favorite recipes: kale pesto, parsley pesto, juices. So besides being able to make so much great food and drinks with your juicer, you’ll be saving lots of money on buying juices on the go. Feel free Contact me for more information or a demonstration. Valeriya: “The JazzMax is much more than I expected. For example, I didn’t expect that the pulp could be used in various dishes. And when my blender doesn’t work for a certain preparation, I use the JazzMax as it’s so powerful in making tapenade and vegetables spreads. It has literally changed my life, I eat so much more vegetables, I also make curries and cookies from the pulp. When juicing, I’m already on a healthy vibe, so it’s a kind of meditation. Even my dog loves the vegetable pulp (not the ginger). Categories: Yogi food | Tags: jazzmax, juice, juicing | Permalink.